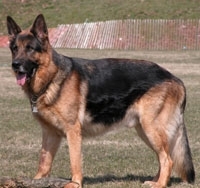 The German Shepherd Dog is susceptible to bloat, skin disease, congenital heart problems and hip dysplasia. It should be noted that the enormous popularity of German Shepherd Dogs has resulted in careless breeding. This has caused a number of crippling genetic diseases within the German Shepherd Dog population. It is important that when contacting a German Shepherd breeder that you express health concern issues and ask the breeder what they are doing in order to help mimimize them. Please don't purchase your German Shepherd from a petstore which commonly are known to support German Shepherd puppy mills. Doing so only promotes inproper breeding ethics and promotes current German Shepherd health issues. The AKC, UKC, FCI, CKC, SKC, WWKC, FIC registries recognize the German Shepherd breed standard. Country of Origin: Germany - favored for its intelligence, trainability and fortitude. Originally a German farm dog, the breed was founded in the 1890's by a German cavalry officer, Capt. Max von Stephanitz who aimed to create a superior herding dog with looks to match. First imported to the US in the early 1900s, it became popular after WW I with the popularity of Rin Tin Tin. Today it is used for search & rescue, police, army, sentry, scent, guidedogs for the blind, helpers for handicapped and companion. Character: This dog is intelligent, unconditionally loyal, obedient, brave, and protective. Temperment: Their territoriality makes them among the least likely of breeds to run away. Unwanted visitors are stopped. This breed gets along fine with children and other animals, provided proper socialization has taken place. Coat: Can be coarse and straight-haired, long and coarse and straight-haired, or wavy long-haired. Colors can be black, grey, with regular brown or yellow-to-light brown markings. Care During shedding a special comb is needed to remove dead hairs. Comments: If correct socialization is done at a young age, dogs fit any domestic situation with owners that are prepared to train and exercise a large, intelligent breed. Often reported aggressiveness is correlated to education, mistreatment or has purposely been smart, and very protective.